No masks, rinses or wonderful shampoos do not make your hair healthy, beautiful, radiant, if there is no support from the inside of the body. Proper nutrition is the basis for all cosmetic hair enhancements. And if in the diet there are products that are responsible for the health of hair, then cosmetic procedures will be more successful, and the result will not keep you waiting for a long time. What products will give strength and shine to your hair? Those that contain biotin, prevent hair loss, omega-3 fatty acids, vitamins B5 and C, iron and antioxidants. And white and yolk will help hair grow faster and eliminate such an unpleasant problem as brittleness. But there is one nutritional secret: to make eggs work better in the hair issue, protein is better to use separately from the yolk. 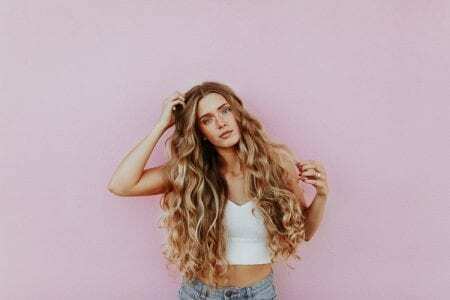 The fact is that protein prevents the full absorption of biotin, which is contained in the yolk and is responsible for the strength of the hair. Therefore, it is better to arrange yolk and protein meals: eggnog for breakfast and meringue for a snack. Nuts are often called “mummy for hair,” because they contain high concentrations of omega-3 fatty acids, biotin, copper, which improves their structure and vitamin E, which does not allow split ends. The greatest concentration of these nutrients contain walnuts and almonds, cashew and Brazil nuts are not far behind them. Advice from nutritionists: any nuts should be eaten dried and not fried, as they lose a significant portion of useful properties when heated. And, of course, do not lean too much on the nuts, as they are high in calories. Fatty fish varieties contain omega-3 fatty acids, which means they help maintain a high moisture content of the hair and scalp. This means that the hair becomes soft, obedient and grow faster. Such fish is useful in any form – boiled, baked or cheese – and it is better to serve or cook it with lemon, because vitamin C is also important for the healthy condition of the hair. These fruits contain an excellent pair for hair: vitamin B5 and beta-carotene. B5 fights brittle hair and helps against split ends. A beta-carotene in the body is converted to vitamin A and enhances hair growth, makes them thicker and shiny. When there are no fresh apricots, try to include orange vegetables in the menu, they have almost the same characteristics. Let the pumpkin, mango, carrot be on your table more often. But combine them with fats, the only way beta-carotene is absorbed. You want to delay as much as possible when the hair will not need to be dyed, but if necessary, eat sweet peppers more often. Trace elements contained in sweet pepper, contribute to the production of melanin – the pigment that is responsible for hair color. Yellow pepper is especially rich in it. Iron, which is also quite a lot in bright peppers, helps the hair bulbs to get more oxygen, and this causes the hair to grow faster. Dark raisins are rich in vitamin C, iron and antioxidants. It “clears” blood from cholesterol and rejuvenates the body as a whole, and protects hair from the harmful effects of sunlight and wind. Due to the raisins, the hair is quickly restored after winter vitamin deficiency or stress experienced by a person.